The original version of this cartoon was drawn many years ago, before the start of the recent proliferation in solar panels. Part of the joke is that sundials are very low-tech devices, whereas the device in the cartoon is very high-tech. Both use the sun as a way of telling the time. 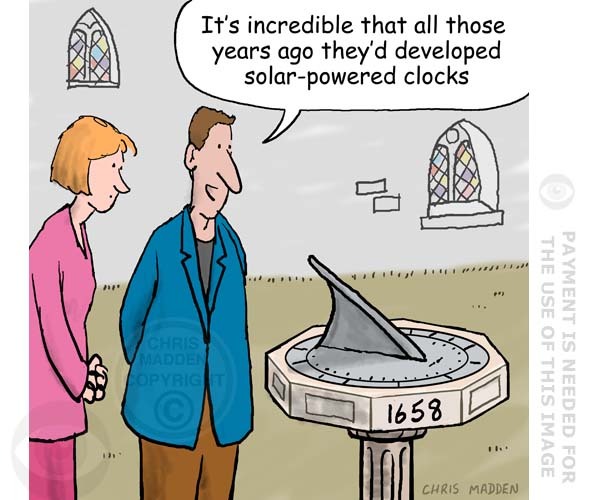 The cartoon questions the need to make everything hi-tech, because the normal sundial works almost as well as the solar panel electronic clock in the cartoon (except when the sun’s not shining of course, but let’s not get pedantic). Cartoon showing a man putting a model of the Loch Ness monster onto his garden lawn. Part of the humour of this cartoon is that the Loch Ness monster is composed of a series of humps that can be placed individually on the lawn, giving the impression that the creature is both above and below the lawn. The joke here is about the pervasiveness of health and safety culture, in which practically every human activity is judged to be hazardous. Health and safety warning signs such as the one in the cartoon are, I assume, a defence against the current litigation culture. The fact that the signs are there proves that people have been warned of potential danger, thus placing responsibility for personal safety in the hands of the person who has been warned. Cartoon about sustainable power generation, featuring an Escher type use of false perspective to make water flow up hill in a garden pond or ‘water feature’. Cartoon of a woman mowing a lawn with an electric lawn mower powered by a generator harnessing the power of flowing water in her garden pond. This is a recently redrawn version of a cartoon that I first drew about thirty years ago in the 1980s. It’s one of a series of cartoons that I drew at the time about sustainable technology – mostly employing absurdist ideas such as the impossible structure here that allows water to flow uphill (borrowed from the work of M C Escher). Other ideas in the series included perpetual motion machines and Heath Robinson devices. A cartoon about sustainable energy, lawnmowers, garden ponds, garden water features, environmental gardening. Cartoon of a gardener at her front door with a watering can. The house fronts straight onto the street, with no front garden. Cartoon of a gardener obsessively measuring the height of his plants. This is a joke about the cliche of the stereotype of the man and his shed – where the garden shed is a man’s ‘den’ or hideaway from his family, where he can do manly (though unthreatening) things. Part of the joke is that you wonder why the garden shed would have a cellar, and what might be in it. By having to pay in order to reach the front door the turnstile stops cold calling door-to-door salesmen, junk mail deliverers, leaflet deliverers, Jehovah’s witnesses and other unwelcome visitors. Only people who really want to visit the house will pay to enter the garden (and possibly get a refund when the front door is answered. I think I may install one of these devises myself now that I think about it. Garden design cartoon – is there a swimming pool in this garden? Comic illustration showing a swimming pool diving board visible over a garden fence. A joke showing a gardener buying a new lawn mower in a garden centre. The salesman is saying to the prospective customer “This lawn mower’s for the man with a very large lawn – it’s fitted with sat-nav”. The implication is that the mower is for a lawn that’s so big that you need gps to navigate your way round it without getting lost. A humorous illustration about how to encourage birds into the garden by providing nesting boxes and feeding areas such as bird tables. A joke about encouraging wildlife into the garden. Is this the first cartoon about 3D printing? A cartoon about 3D printing (additive manufacturing). I’m sure that 3D technology must have existed for a few years before I drew this cartoon, but possibly only in research labs and places that were experimenting with early prototypes of 3D printers. 3D printing definitely wasn’t in the zeitgeist. 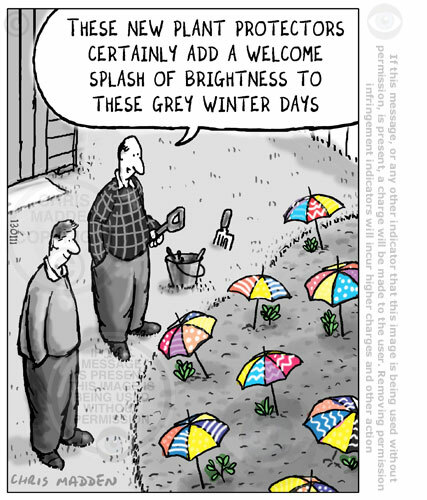 The humour in the cartoon lies in the fact that highly advanced computer technology is being used to produce a representation of a stereotypically simple and technologically unsavvy old gardener. The cartoon is partly a comment on the fact that advanced technology inevitably often ends up being used for mundane purposes (just look at television and mobile phones, where trivial content has to be bounced off satellites in order to reach its destination). This is not a criticism of this phenomenon, just a humorous observation. Chess cartoon and gardening humour. Topiary bushes in plant pots in a garden, shaped like chess pieces. The plant pots are on a checkered patio that looks like a chess board. A person is clipping one of the bushes into the shape of a bishop. A humorous illustration about board games, outdoor games, novelty chess pieces, unusual garden design. Showing a plant harnessing energy from the sun. The plant in the cartoon is artificial (a sunflower) and the energy it is obtaining is being used to drive a speaker which is producing the sound of birdsong. 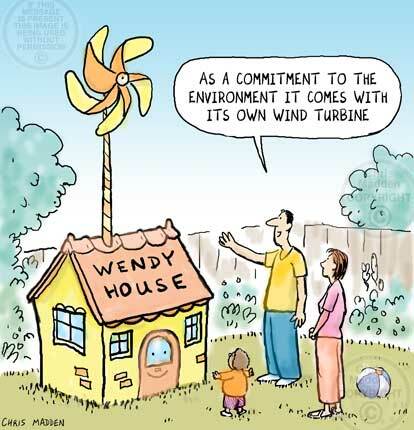 A humorous illustration about alternative energy, sustainable energy, renewable energy sources, electricity generation. Cartoon – someone wearing bare patches in a lawn by cutting the corner on the garden path. 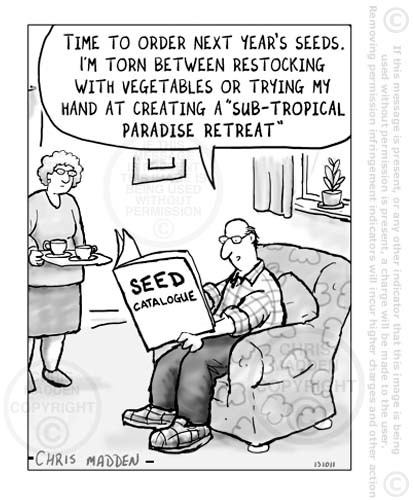 Cartoon showing an unforeseen consequence of garden design. The cartoon brings to mind the expression “up the garden path”.